Mobile commerce platform mShopper recently debuted GetFirstDibs, an SMS-based tool integrated into the mShopper Mobile Commerce Platform. 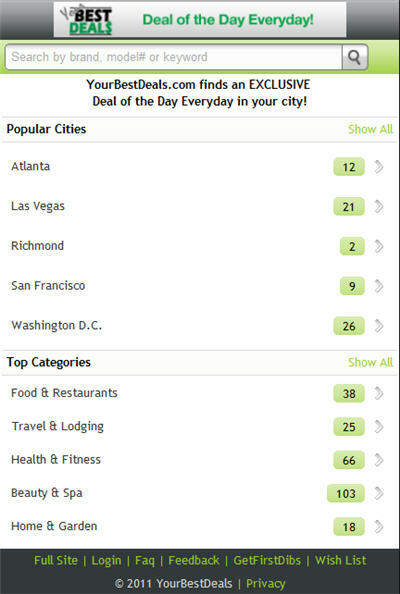 The interesting application for affiliates with GetFirstDibs is that it could be used as a white-labeled daily deals site – think Groupon meets SMS text messaging. You can see an example on smartphones at http://yourbestdeals.mshopper.net/. Merchants can use the mobile platform to run SMS marketing campaigns, too. mShopper reports that some of their current merchants have been trying out GetFirstDibs and they have turned up some impressive results. One of their merchants, a U.S.-based eTailer with approximately 100K visits a month to their site, began transmitting GetFirstDibs alerts in March, 2011 to approximately 500 permissioned mobile phone numbers. This campaign resulted in unit sales increasing by 4X in March from the previous month. More on GetFirstDibs at http://mshopper.com/platform/getfirstdibs.php.